Let me start by saying that I love Star Wars. Haven’t always been close enough to a public library or had the funds to buy the latest books, but when I could, I did. I’ve seen all the movies at least once. I happily enjoyed them all, though I refuse to watch the last Anakin movie again because its just too sad. We all know what’s going to happen and I care so much about Obi-Wan that seeing his world crumble, well, suffered once, have the memories. Seriously, Obi-Wan had it hard. posted online by Peter Mayhew, who played Chewbacca in the original Star Wars trilogy. And I realized something. The Wookiee is Han’s best friend. As in, a dog is man’s best friend. He’s even shaggy and his language sounds vaguely like a cross between a dog and a bear. And I started giggling and wondering if I was a racist towards Wookiees, or maybe if that was just George Lucas who was racist towards Wookiees. Think about it. We probably all reacted to Chewbacca like he was Han’s dog. Did you even once think that maybe, just maybe, he would run out on Hans and save himself? Is there any exploration on whether or not Chewie is willing to risk his skin to help Han help Leia? Does Leia try to get Chewie to stay and help or does she just focus on Han? Luckily in the books, it gets a little better. A little. Chewie as a character never evolves that far though. He stays loyal to Han Solo through everything and eventually dies, saving his family. 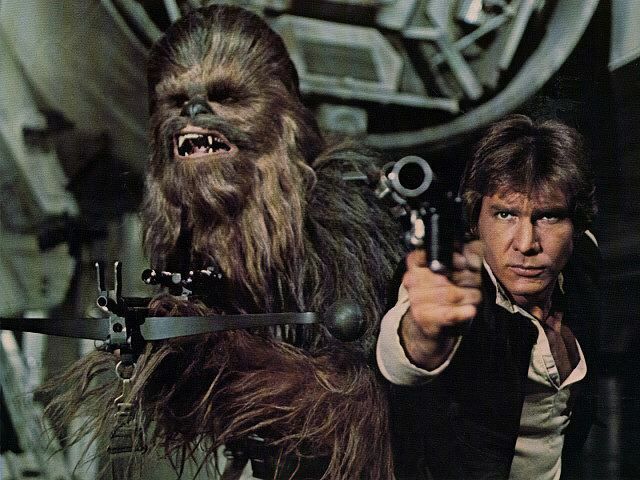 We never know how much of a full person Chewie was until Han is struggling in the aftermath of his death. Doing my research to double check spellings, I found out that Chewbacca was actually inspired by George’s Lucas’s dog, Indiana. So, my realization must not be just my imagination. But Chewie really deserved to be so much more than a sci-fi stand-in representation of a dog. For any fans out there, you know he was a full and complete sentient. They must have just left all those story lines out when they cut the film. This entry was posted in Fantasy and tagged Han Solo, Han Solo's best friend, Leia, man's best friend, Wookiees. Bookmark the permalink.